It's best to plan ahead to avoid headaches down the line. Cook a trial batch to see how complicated and time-consuming the recipe will be. Figure out how your goods will be packaged and shipped before you start a production run. The US Postal Service provides free shipping boxes of various sizes when shipping via priority mail. In most cases your packages will arrive in 2 days or less when shipped by priority mail. Other sized shipping boxes are available from Fedex, UPS and other shipping supply stores. Liberal use of bubble wrap is recommended to protect the goods during shipment. Loose cookies like springerle, lebkuchen, brunsli and sugar plums are best packaged in a cardboard or aluminum container to protect them while shipping. We recommend adding layers of parchment or waxed paper to prevent the softer brunsli or sugar plums from mashing together. Fig chutney is made with a canning process using glass jars. An "apron label" can be used to wrap the jar top. 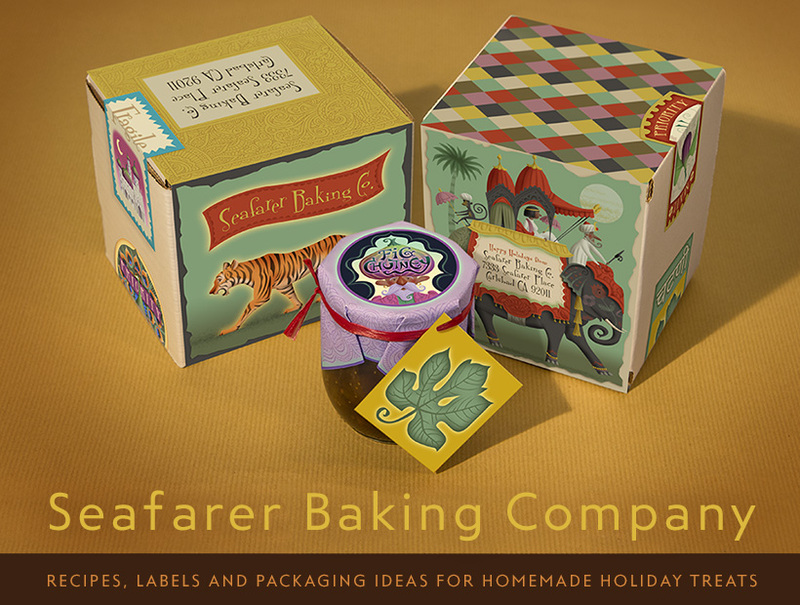 Biscotti and Turkish delight lend themselves to a traditional rectangular shaped package wrapped with decorative paper, so for these recipes the labels may work best as rectangles that fit the shape of the package. Kerststol can be wrapped in a similar way, though the shape is more of an oval. Panforte, shortbread and gateau breton are usually baked as a round cake. One way to package them is to place them in round, squat metal containers. A less expensive alternative, and one that looks quite nice, is to wrap them with a decorative paper and place a round label on top. We recommend placing food grade cake rounds, slightly larger than the diameter of the cake, above and below the cakes to protect them during shipment. Below is a method for wrapping a flattened cylindrical object such as a flat, round cake. Panettone can be wrapped in this way as well, though we prefer to flip the wrapping method upside down so the taped corners are on the bottom and the cake round would only go on the bottom of a panettone.